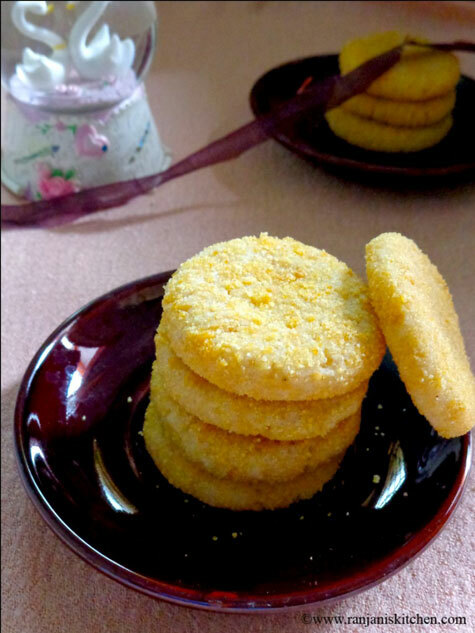 CornFlakes Cookies / Eggless CornFlakes cookies – Easy and crispy cookies, which we can make with the avail ingredients in the pantry. I referred this recipe from sharmis passions. She made it as a milk free recipe. I added a little milk while making the dough. If you are vegan, switch to water rather than milk. Coating with corn flakes coarse powder is optional. But its recommended for crispy and crunchy outcome. Refer the notes for temperature settings. If you are newbie to oven usage don’t give up if not getting the success outcome. Each oven has different temp settings so if you try two more times it will come to your hand. It’s a simple baking for some, but why I am telling all this is for newbies like me. I got these cookies after two more attempts. So write me if you have any questions about the recipe. I am very happy to write you back. Take all ingredients to room temperature. Preferably use softened butter. Take all the ingredients ready and grease the baking tray and keep aside. Pre- heat the oven to 180 degrees for 10 mins. Take ½+1/4 cups of corn flakes in mixer cup and grind it to a coarse powder. Do not grind to fine powder. We need some crunchiness on the cookies. So we can grind coarsely. 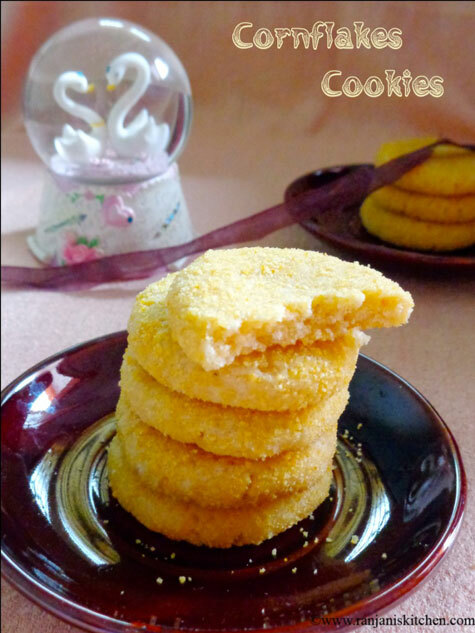 Once done take ½ cup of powder for cookies and keep the remaining for outer coating of cookies. Take a wide bowl, add granulated sugar, vanilla essence and butter. Beat well till becomes frothy and fluffy. Sieve all purpose flour, baking powder and salt together. Add these to beaten mixture and knead to a soft dough. If the dough is too thick, add little milk and make as a soft dough. Pinch a small portion of the dough and make a small ball, then flatten them slightly using your palms. Coat the flatten cookies with the remaining ground cornflakes. Just dust on both sides and gently press. Do the same for remaining flour and line it up in a greased baking tray. Place the tray in preheated oven and bake it for 15 mins to 17 mins at 200 degrees. After 15 mins, remove the tray from oven and let it cool on wire rack for 15 mins. At the start it will be soft. After cooling completely it will become crunchy and crispy. Adding milk is optional. If the dough is soft, no need to add milk. Do not grind the cornflakes finely.Coarse grinding is enough. If the flakes are not sticking with the cookies, slightly coat with milk and dust it. Temperature settings may vary from the ovens. The original recipe has the temperature setting of 180 degrees with the timing 12 mins.Mine took 15 mins at 200 degrees. Check the cookies in mid. If you feel it starts browning, stop and reduce the temperature. Cookies will be a little soft in hotness. After it cools down it will get firmer. You can use powdered sugar as well. Make sure the measurements are correct. If you feel the sweetness is less, you can add little more sugar. I love the colour!The cookies look so crisp in the the inside! yes its crisp and crunchy one due to the presence of cornflakes. 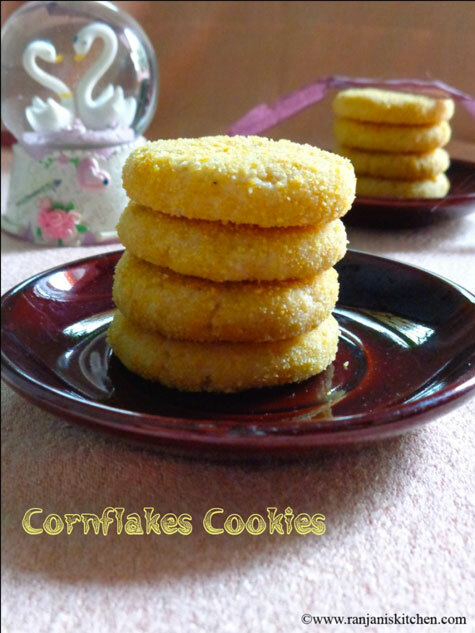 I am yet to try this crunchy corn flakes cookies, you have baked them perfectly…loved its nice golden color! 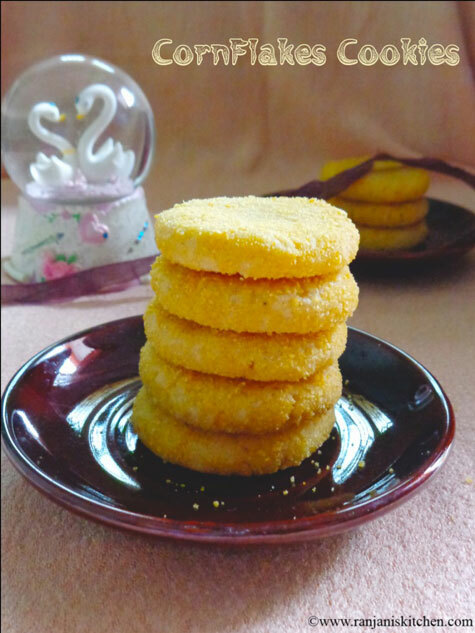 I am yet to try this crispy Cornflakes Cookies, you have baked them perfectly…loved its nice golden color too!